That there are Americans citizens who support Israel financially, politically and socially is not exactly an unknown fact. However, the recent atrocities committed by the Israeli military in Gaza have brought to light another fact - one that is perhaps lesser known by the global public - that is, there are American citizens who support Israel militarily by fighting as Israeli Defense Force (IDF) soldiers. 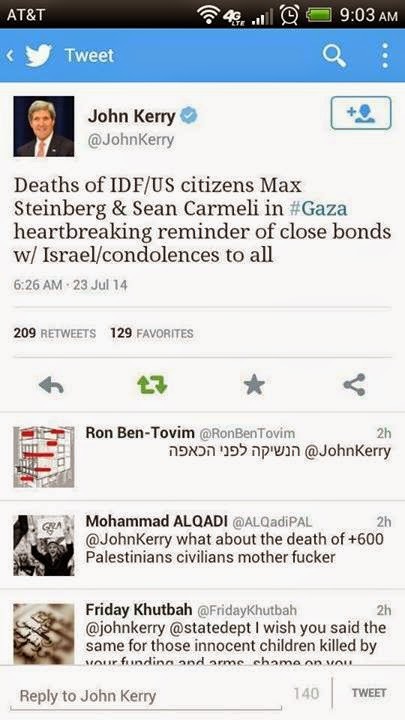 This fact was publicized by no less than the US Secretary of State, John Kerry, when he offered his condolences, in a tweet, to the two dead IDF soldiers who were US citizens. This he did, to re-affirm the "close bonds" between US and Israel. One supposes, he needed to do that given his "hot mic" faux pas and the recent US FAA ruling preventing US flights into Israel (which has since been reversed). When Kerry publicized this lesser known fact, he demonstrated to the world that his fellow American citizens were free to lend their support and show their allegiance to Israel by enlisting in the Israeli military, and that this would be perfectly acceptable to the US. Never mind, that the massive humanitarian impact of the IDF military strikes on Gaza is by now undeniable - some 788 Palestinian civilians killed, over 5100 Palestinian civilians injured, Palestinian houses, hospitals, mosques and even UN schools have been targeted and destroyed by IDF bombs (IDF has deemed that 49% of the Gaza land area is open to their attacks) - in stark contrast to the three Israeli civilians killed and 29 IDF soldiers killed in battle, which indicates a indiscriminate and disproportionate use of military power by Israel. Never mind that the UN Human Rights Council had recently voted to launch an inquiry into potential violations of human rights by Israel in its conflict with Hamas in the Gaza Strip. Never mind that the UN human rights chief, Navi Pillay said "the disregard for international humanitarian law and for the right to life was shockingly evident" and that the UN Human Rights Council would investigate “all violations of international human rights law and international humanitarian law” in Palestinian areas. Predictably, the US voted against the above-mentioned resolution that was drafted by Palestine, which was supported by 29 of the 46-member UN Human Rights Council. After all, it is one thing to be complicit in aiding an errant ally through financial and political means, and quite another to knowingly send off American citizens to partake in Israeli war crimes.